Unlike the sale of a Tesla, most transactional and legal problem situations are negotiable. In real estate negotiation, the image or perception of having power is not the most important factor for getting what you want. It’s all about using strategies to achieve common ground. Sure, if you have financial or legal leverage, you have an advantage, but it’s secondary to achieving true agreement. At the end of every negotiation session the parties receive something of value and give up something of value to achieve a consensus or agreement. The challenge is for David and Goliath to come to common ground on material points and for both to avoid worst case scenarios. Assess whether the opponent is negotiating in good faith or just posturing and bluffing. Sometimes an opponent may be using a real estate negotiation session to obtain knowledge and is not negotiating a true resolution or settlement. Do your investigation and due diligence. If you don’t believe or trust what the other side is claiming ask for documentation or legal authorities to back it up. Be detail oriented in your quest for making a deal or agreement happen. Think of everything you want to achieve and list it out in a simple way. The parties want transparency and for you to know the details, ask the right questions, and deal with them. If you don’t understand an issue, ask an expert. Fortify yourself with a briefcase full of experts and their reports to show you are strong in your position. Experts may include appraisers, surveyors, engineers, licensed contractors, plumbers, other trades professionals, and, God forbid, attorneys. Understand the concept of “worst case scenarios,” and what it will cost to avoid them. Generally speaking, there are three type of worst case scenarios- financial, social, and legal. This is especially the case with real estate contracts that shift attorney’s fees and costs shift to the losing party. If you go to trial and lose the case, you risk being liable for the other side’s attorney’s fees and other litigation costs. If you use a mediator in real estate negotiation, please learn everything you can about the mediator’s background. Does the mediator have a bias because he or she is hired by the same parties over and over again? This type of mediator may be so biased that he or she will not be fair to your side in the real estate negotiation. Does the mediator understand the subject matter? Is the mediator explaining why each side’s position is valid or invalid? Listen to the other side carefully and try to achieve some common ground on major points. Many real estate negotiation sessions fall apart because one side has to win on every minor, insignificant point. This approach frequently leads to an unsuccessful session. Put yourself in your opponent’s shoes to understand the details of what the adversary wants, but don’t believe everything you hear. Money does talk. Arm yourself with sources of funding to fund a resolution. Having insurance in place or a source of capital or loan funding or a sugar daddy is a great asset. Insurance policies can be a shield and sword to protect your interests, and can fund a resolution. Silence can be a powerful tool. Silence has the implied message of “no,” or “you have to wait,” or your position is “ridiculous” and may force the other side to change its course or grant some major concessions. Take a calculated risk and ask for all and more than you want. Stretch the rubber band to its breaking point and see how the opponent reacts. You might get more benefits and concessions than you anticipated. If you have to pay money to settle a dispute, don’t offer all that you have on the front end. Make your opponent wait for it and make incremental offers over time to get into a desirable settlement bracket. 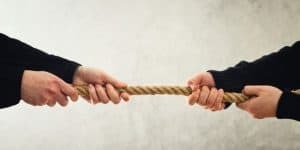 Don’t be afraid to call out an opponent’s position as being unfair, unreasonable, unrealistic, or unlawful if you can back up the proposition with concrete reasons. Don’t make it a personal attack. Chip away at the position, not the person. If you are a fiduciary (like a real estate agent or have a power of attorney) and a client or principal wants you to keep some information confidential, keep the information confidential, unless the law mandates disclosure. Obtain all of the terms of a transaction offer/acceptance/counteroffer/settlement agreement in writing, personally signed and dated by the party. Otherwise the agreement terms may be unclear, and may not be enforceable.